Paul O. Jenkins has been a Beatles fan since 1965, when his father bought him a copy of Rubber Soul. 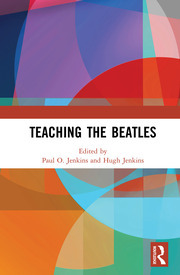 An academic librarian, he has taught his Beatles course at Mount St. Joseph University (Cincinnati, OH) and Franklin Pierce University (Rindge, NH). Paul O. Jenkins has published numerous works about music, including a biography of Richard Dyer-Bennet, and the liner notes for Ralph McTell's boxed set, The Journey. A fan of rock and roll, folk, and bluegrass music, he is currently working on a biography of the McLain Family Band. To Jenkins, music is the most emotional expression of life. We all have a soundtrack to our lives, and his includes The Beatles, Bob Dylan, Ralph McTell, Richard Dyer-Bennet, Pete Seeger, The Saw Doctors, The Clancy Brothers, and too many others to include here. The Beatles, folk music, Ralph McTell, bluegrass music, academic librarianship. Harmonica, concertina, golf, tennis, baseball, soccer, wargaming, toy soldiers.